The Ponca City Board of Commissioners approved a request for authorization to advertise for bids for construction of improvements for the Lake Ponca Deep Water Boating Access Project. These bids will be for Phase 2 of the project, which includes the construction of the new deep-water boat ramp and a new asphalt parking and ramp access paved loop. A new courtesy boat dock will be purchased and installed as part of Phase 2. The first project to advertise for bids will be the deep-water boat ramp project. 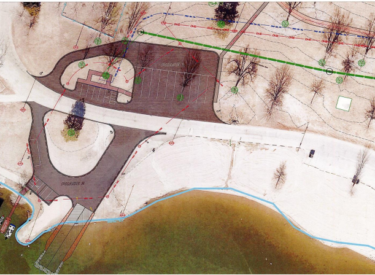 The other elements will be scheduled to coordinate with the boat ramp project. In-kind work that the City will be performing includes installation of parking lot lighting and electrical service as well as signage and striping of the paved access loop and parking area. The City is also providing all engineering, survey, design, and inspection services as well as grants administration services. In February 2018, the City Commission approved the submission of a grant application to the Oklahoma Department of Wildlife Conservation for construction of Phase 2. The total estimated cost of the project is $452,150.69 with Ponca City’s share being $113,037.67 (25 percent) and the ODWC share being $339,113.02 (75 percent). The city’s share will be funded by both in-kind services estimated at $73,704.69 and cash estimated at $39,332.98. In late September, City staff received official notification from ODWC that the Phase 2 project and funding are approved. The notification said the project may begin Oct. 1, and must be completed by June 30, 2020. Construction for the Phase 1 elements is already underway. Sober Brothers, Inc. of Ponca City was the low bidder for all Phase 1 construction items, including construction of a paved boat trailer parking area, a new restroom facility and over 1,700 linear feet of new 10-inch sanitary sewer main to service the restroom. Phase 1 also includes in-kind elements performed by the City similar to the Phase 2 project.